Great news, today it didn't rain, well didn't rain much, and we were able to walk all the way without wearing waterproofs. The weather is still not settled however and, from the shelter of Hess Hutte, we have just watched a hail storm lash it's way across the mountainside. Really nice walk, very civilised and not too far, 7 hours, about 20 kilometres with 1,000 metres of climb. Unless we get lost there shouldn't be any more of the 10 hour days we did last week. We left Modlingerhutte at 8.15 and were having beer, fried potatoes, saur kraut and sausage in Hesse Hutte by 3.15. Must say we are getting into hutte accommodation. The food is plentiful and there is a good atmosphere. Washing facilities are variable (no hot water tonight), but it seems less important when everyone is in the same boat. Based on my experience, if you avoid Friday's and Saturday's the huttes are never more than a third full and at that level of occupancy even a dormitory is tolerable. The best thing about them is the location - on the route, in the mountains and often dramatically positioned on a ridge or under a cliff. Modlingerhutte had a nice location but it's special feature was its cakes and puddings. I am becoming a strudel expert and this was one of the best, all the extra bits (almonds, raisins etc) and a supersized portion - excellent. 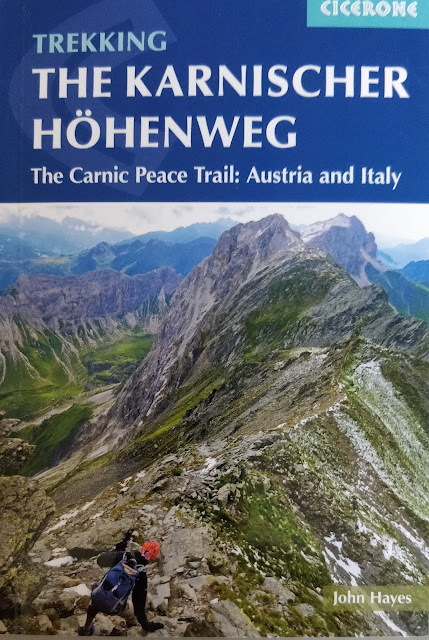 The walk itself was in three parts: a steep knee testing walk down to Johnsbach; a gentle climb up the Johnsbach valley, mostly alongside a river, and then a long climb up a side valley to Hesse Hutte. 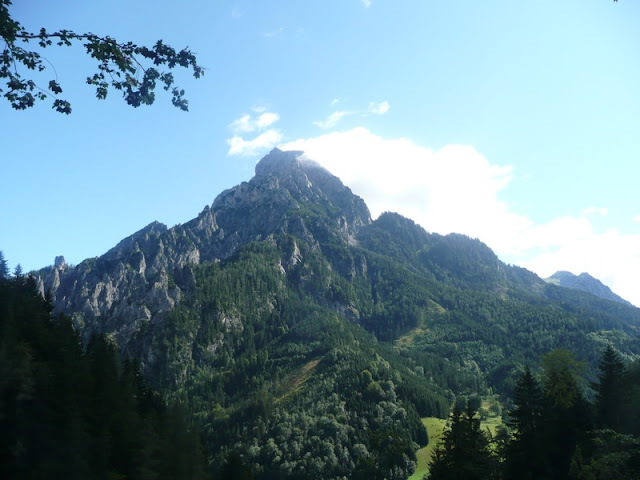 The highlight of the descent were the increasingly dramatic views of Grosser Odstein on the northern side of the Johnsbach valley. Initially it was surrounded by swirling clouds but for a short time these cleared giving visibility of the whole mountain. 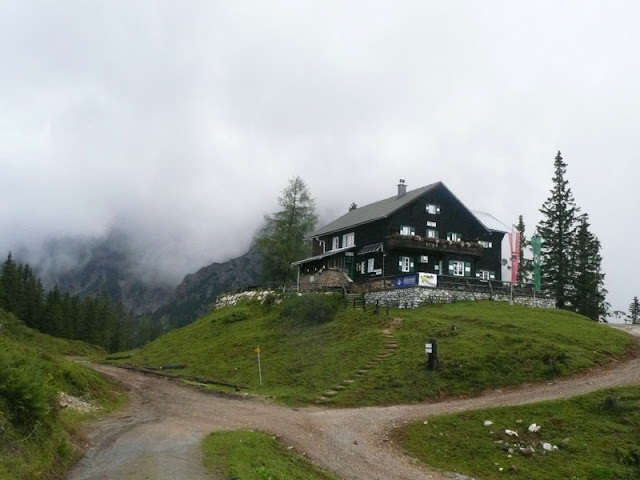 Stopped for a coffee in Johnsbach at the Donner Gasthof; we would have stayed there last night if we had made it down from Modlingerhutte and it looked like it would have been an excellent choice. The early part of the walk from the valley bottom up to Hesse Hutte went through meadows and we saw our first ever alpine bull. Roger and Sue of course saw one a couple of weeks ago and I must admit I was slightly sceptical. 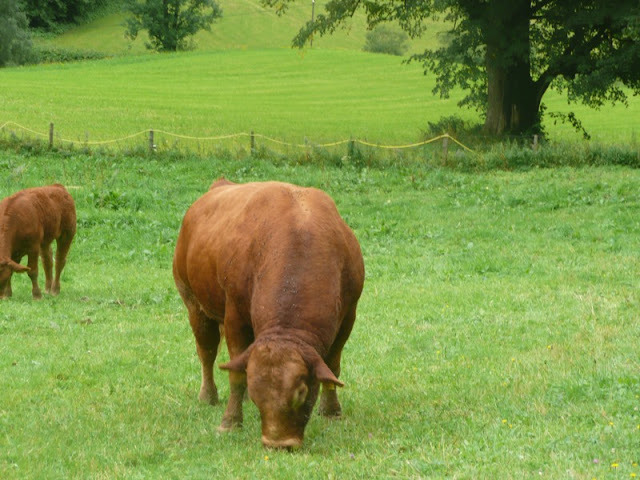 Anyway our bull was munching grass about half a metre from the path and didn't even look up as we worked quietly past him. We enjoyed the walk up to Hesse Hutte. A steady climb, steep in places but a good path. 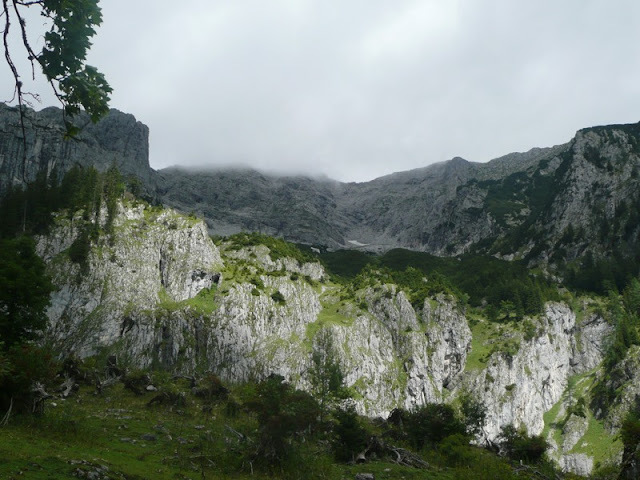 The huge cliffs, initially beneath Grosser Odstein and the Hochtor summits, were somber, even slightly sinister, but definitely gave you the feeling of being out in the wild. Any sense of isolation was completely shattered when we got the Hutte. It felt like the crowd of Austrian walkers had been enjoying the bar all day and we were just a bit suspicious of their attempt to persuade us to have the mountain goat soup which they claimed to be the special. As already mentioned, we chose sausage, fried potatoes and saur kraut and very good it was too. My camera by the way is completely useless, I'm now using Christine's. The challenge will be to recharge the battery. Nice to hear from you and the complicated days passed through. Hope the days coming will be peaceful and pleasant. Enjoy the last days walk for the finish line is near in Budapest. Gutted about your camera. You must have got through about five Lumix's now?